Via social media, phone calls and emails, people brainstormed plans ranging from preserving the massive machine’s cutterface with art installations to revving it up for another tunnel-boring project. A memorial to honor construction crews’ work on Bertha? An animated art installation to simulate the tunnel-boring machine’s cutting? Or, a flying saucer for a movie set? Last week, Traffic Lab asked readers to brainstorm ideas for what they think should become of Bertha’s front end now that the machine’s 1.7-mile dig underneath downtown Seattle is complete. Via social media, phone calls and emails, people shared plans ranging from preserving the massive cutterface with local art displays to revving the machine up for another tunnel-boring project in the area. In the end, Hitachi Zosen, the machine’s builder, owns Bertha’s parts. Crews now are cutting up and lifting sections of the machine’s front-end steel, with plans to pull the machine’s rear conveyors, walkways and hoses back through the tunnel. Other pieces will likely be melted and recycled. Hitachi Zosen has said it would gladly consider leaving part of Bertha in Seattle as a public artifact. That would please some readers who contacted the newspaper. A selection of responses are below, some of which have been edited for length and clarity. Or, the Seattle Art Museum’s Olympic Sculpture Park? “Given the huge size of the machine, the status of the megaproject bound up with the hope and dream of a future world-class waterfront, and the community fame attached to Bertha, every effort should be made to keep as much of the tunnel-boring machine here as logistically and financially possible. “MOHAI would seem to be the best option. Ideally, the museum should be allowed to preserve the machine’s whole cutterface. But at the very least, it should be able to keep some of Bertha’s 700-plus teeth. “The tunnel-lining ring erector arm would make for a fascinating installation with a few of the spare tunnel lining rings that still exist. The controller’s console, which was used to move the rings into place, could make for a good display, as well. “The tunnel-machine console room would also be a great addition as part of a special room at MOHAI. I am sure the people who worked on the tunnel project would want to see some preservation of their hard work in this specially-designed room. They did work days, nights, and many weekends. “Or, maybe an art installation displaying different parts of the tunnel shield, forward thruster jacks, and elaborate trailing gear at Gas Works Park? Perhaps artists could make a pillar of soil samples from the different stages of tunneling? “My intuitive reaction, as a sculptor, was a vision of the primary cutterface arms representing the cardinal directions of a compass. 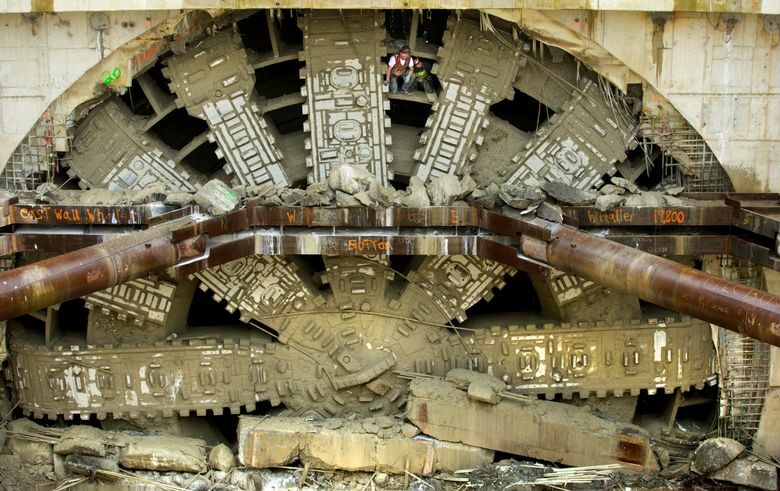 This would invoke the innumerable controversies surrounding the Bertha project, as well as the machine’s ultimate triumph. The scale alone would be profound. Coupled with the myriad of metals and mechanical components in the cutterface, this display would truly be a representation of the project that ultimately found its true north.